Looking for me? I’m out here in the garden, doing what I would otherwise have been doing indoors. Last spring as I sat working away on my computer, Beatrix the Hummingbird built a nest in the outdoor chandelier. There we sat for weeks she and I, face-to-face some six feet apart, me sitting on my bench busy with my work, she sitting on her eggs busy with her work, the chandelier rocking gently in the wind. One day Beatrix stopped coming. I began to miss her so I climbed on the bench and peeked in her nest for a clue to her absence. My heart sank. Something had discovered her tiny perfect little eggs. A rat perhaps? Another bird? The baby possum I had seen running along the top of the brick wall? There they lay as Beatrix would have found them, broken and lifeless. Summer began to bloom so that by mid-morning it was too hot to stay outside. Besides, computer batteries only last so long. What I really needed was a bit of privacy, some shade and some electricity. What I really needed was an outdoor room! The previous owners had erected a pergola that I was determined to press into service. An electrician routed wire via an underground PVC pipe and created outlets. Voila, electricity! Two sides were bordered by walls so I potted Bougainvillea vines along the third and hung curtains on the fourth, which faces the street. Voila, privacy! Growing king and queen palms threw their leafy arms across the “ceiling”. Voila, shade! Next was comfy garden furniture: a coffee table to work on plus a bench, chairs and ottoman for my feet, all with apple green cushions (from Smith & Hawkin’s going-out-of business sale). Beatrix still passes by on her morning nectar runs but now, rather than “barking” at me to claim her territory (as hummingbirds do) she just pauses curiously to look. I like to think we’ve gotten companionably used to each other’s company. I keep red Mandeville in flower for her breakfast, hoping she will stick around for spring and try building her nest again, this time in a better spot. Is there anything better than warm, juicy strawberries picked right from your own pot? I think not! They are soooo easy to grow you’ll wonder why you ever put up with the mealy, tasteless variety found in grocery stores! Strawberries can be grown in hanging pots, regular plant pots, directly in the soil, or in strawberry pots. The latter is so charming it deserves your consideration. 1) Terra-cotta or glazed ceramic pots. 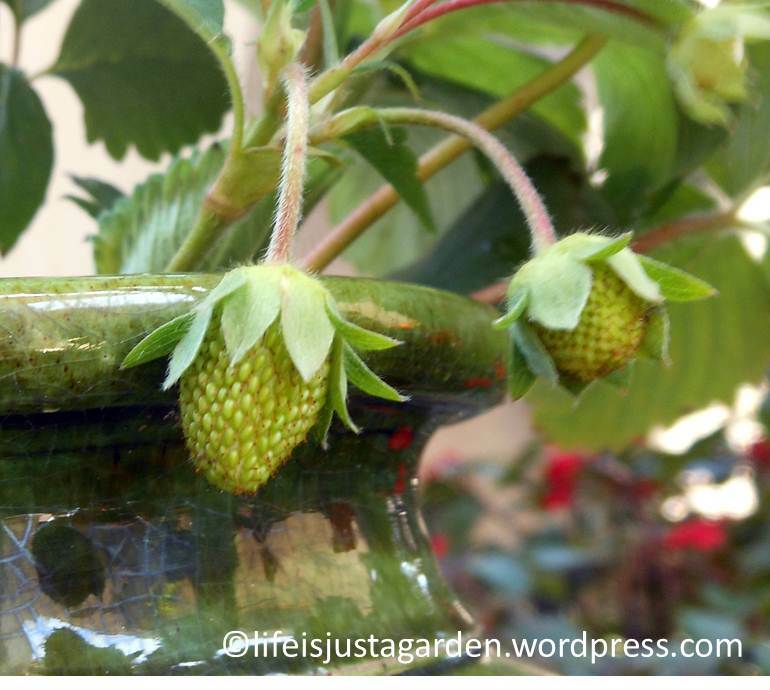 Larger pots can house more plants, so you will harvest more berries. Don’t worry about having too many berries; everyone you know will want some! 2) Sandy, loamy potting soil. Strawberry plants love good drainage. 3) Top quality compost and a bag of 10-10-10 nontoxic, organic fertilizer (provides the nitrogen on which strawberry plants thrive). 4) Sunny spot – at least half a day of direct sun for a plentiful yield. Some of my strawberry pots sit next to my other sun-loving plants: tomatoes, basil, cucumbers, squash and peppers..
5) Which strawberry plant? Each variety has its fans. June bearers produce once a year while ever bearers, contrary to their name, produce 2-3 times a year: spring and late summer. A third variety called day neutral, which produces continuously from June through September. Some say the June bearer has a larger, juicier berry but the ever bearer’s has more concentrated flavor. Why not plant one of each and see which you favor? 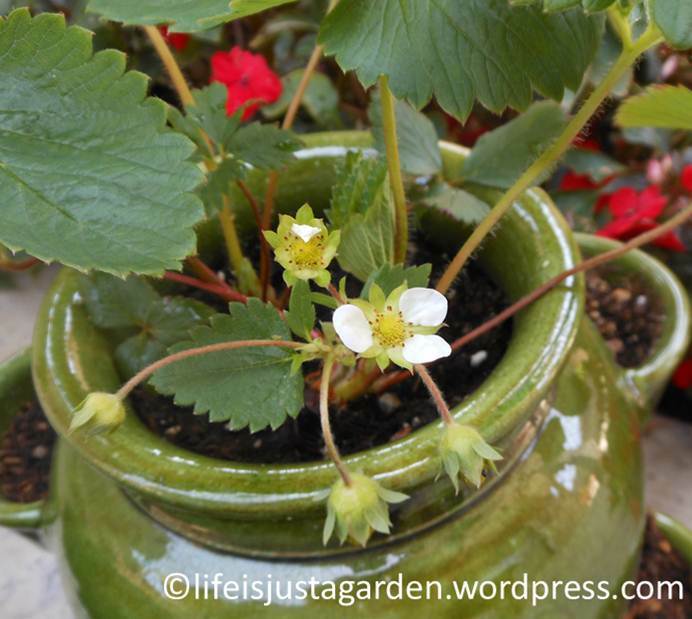 Mix organic fertilizer (I like Miracle Grow’s organic fertilizer) and organic compost into your potting soil and fill the pot with the mixture..
For strawberry pots, also fill the outer “cups”, taking care not to pack the soil too tightly (remember, good drainage!). The purpose of the cups is to “catch” and root the long runners that strawberry plants throw out. These runners become new “daughter” plants. However, for the first two years you can snip off the runners so the plants can focus all of their energy on growing berries. During this time, you can place mature plants in the top and the cups. Be sure to plant the crowns well above soil level or your plants will languish. .Replace your strawberry plants every three to four years because eventually their vigor and production decline. Remember those runners? Strawberry plants politely propagate themselves like crazy . When you need new ones for the following year, remove the mature plants from the cups and plant them in the tops of their own pots. Allow them to throw out runners, which will spill over and root in the cups. Once solid root systems have formed, simply clip the runners to set them free from their parent plants and either place them in their own pots or let them thrive where they are for several years, until you need them to produce fresh plants via their runners, continuing the cycle. Now what could be easier and more delicious than that?!.. Related article: Got Strawberries? Top 5 Things To Know!